An Eastern Cottontail hides under bushes at the Lincoln Park Zoon entrance. It is uncommon for a rabbit to be out during the day. 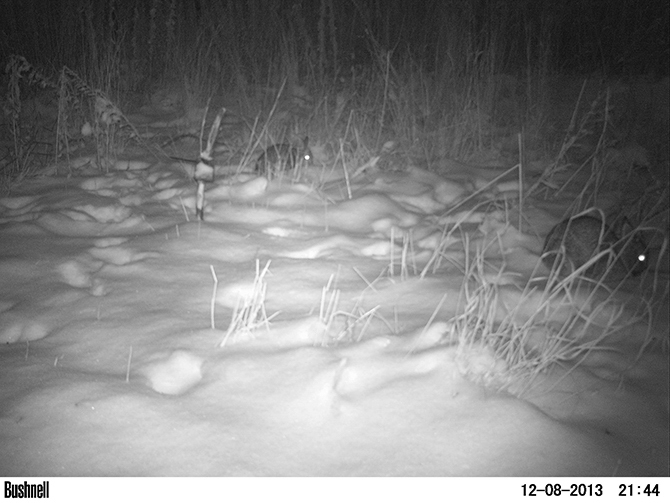 The Urban Wildlife Institute uses cameras to spot rabbits, both day and night. Camera 'traps' capture night-time images of rabbits in Chicago. Our question about rabbits comes from Curious Citizen Jennifer Gadda, who says when she lived in San Francisco and New York, she hardly ever saw rabbits. Not so with her time in The Second City; the little guys were all over the parks or springing between grass and gravel. What&apos;s the deal with all the bunny rabbits that inhabit the urban areas of Chicago? Most importantly, where do they go for the long winter? According to our sources, it’s likely that Jennifer’s fine, four-legged friends are members of our region’s dominant species, the Eastern Cottontail. 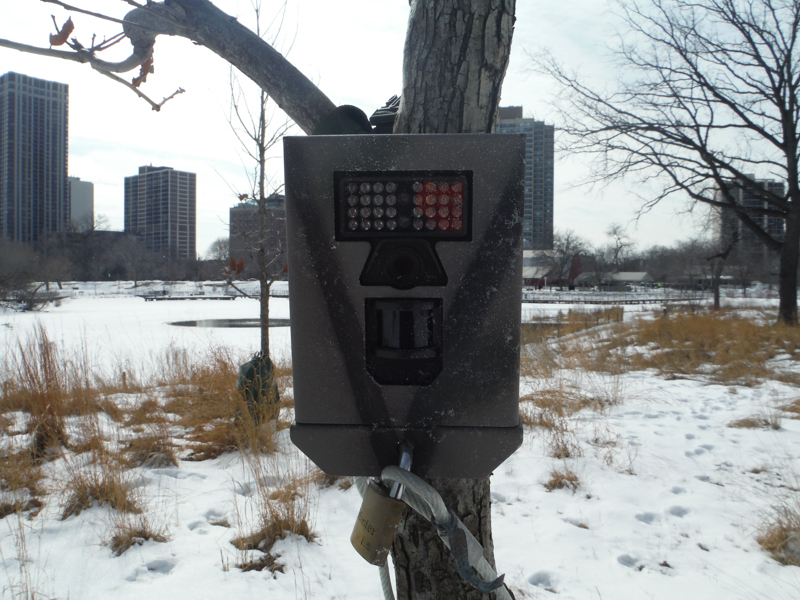 It’s difficult to estimate how many actually inhabit the city, but The Urban Wildlife Institute at Lincoln Park Zoo has made a go of it, having set up 118 camera “traps” across the city to catch rabbits doing their thing. The heat-sensitive cameras take a photo every 30 seconds or whenever they’re triggered by motion. Mason Fidino, who spearheads the Institute’s ongoing research on the species’ behavior, estimates there are 200 or so wild rabbits on the zoo grounds alone, which translates to a density of about 30 rabbits per hectare. “This implies that our density of rabbits in this area is far greater than reported estimates of rabbit densities in natural areas of this region (from other people’s work),” he says. Translation: Chicago’s likely full of rabbits, or at least more rabbits per hectare (or acre) than nearby suburbs or natural areas. If the rabbits had to pick a neighborhood, it would definitely be Lincoln Park and the real estate around Museum Campus, where the little fugitives have had quite an effect. They eat shrubs and bark, so it’s common to find their bucktooth prints on trees. The Chicago Park District estimates that, in 2002, more than $50,000 worth of Grant Park’s plants and trees ended up in rabbit bellies. The Horticulture Department at Lincoln Park Zoo estimates that rabbits chowed $15,000 worth of landscaping during a recent winter season. If you don’t buy Findino’s take on the rabbit population, consider another one. In his book Rats, Robert Sullivan equates the long-eared mammal’s bold presence across Chicago with the commonality of rats in New York City’s subways. Regarding Jennifer&apos;s follow-up question about the fate of the rabbits during winter, Fidino says the answer’s straightforward: Most rabbits die over the winter. A Lincoln Park Zoo study estimates a winter mortality rate of about 70 percent. The critters compensate for this dismal figure by mating like ... rabbits. One female rabbit may have up to 25 babies each year. In frigid temps, many of those babies don’t survive. Those that do? They hide. During the winter, many will make homes in warm places right under your nose. How you interact with your environment determines how many you’ll see. Fidino says if you have a garden covered by a fresh layer of snow, rabbits are probably there. When asked where he would hide if he were a rabbit, Fidino says he’d join the bounty of bunnies storming the Lincoln Park Zoo. He also said he would hide behind a large waste bin. The Eastern Cottontail is qualified for the job, as it’s a crepuscular species (meaning it comes out of hiding only at dawn and dusk to forage food). Hopping around during the dusty twinge of the violet hours makes it easier to avoid predators. Still, there are more obstacles to staying alive. According to the Illinois Department of Natural History¸ there are about 2,000 coyotes hanging out in our diverse urban jungle, along with other predators. Cottontails are toward the bottom of the food chain, making the struggle to find food harder. What’s more, they are susceptible to Tularemia, or “rabbit fever,” an infectious disease that spreads quickly, just as bubonic plague can. The disease wiped out between 40 to 60 percent of the city&apos;s rabbit population in 2013. In 1930, plans to relocate rabbits from the city to a local forest preserve were halted due to the disease. If you spot the brown creatures during daylight, there’s a chance they could be in in danger. Red Door Shelter, an animal rescue center on the city’s North Side, has created an up-and-at-‘em community that snaps pictures of the furballs as they huddle near car tires or under porches. Members post pics to the shelter’s Facebook Page and assign search parties to follow up on “bunny action alerts” when necessary. Search parties determine whether the rabbit in question is wild or a domesticated breed. Greetis says there’s a peculiar rise in the number of rabbits that are let loose in the winter. The group’s rescued 54 since Easter of 2014. Following rescue, the shelter will search for the bunny’s owners or put it up for adoption. If you find some wild rabbits hopping along the side of building or nestled under your deck, they’re probably okay. Dawn Keller is the Executive Director and wildlife ecologist at Flint Creek Wildlife Rehabilitation, the city’s only wildlife hospital. She advises you to leave wild rabbits alone if you find one. Jennifer is no stranger to wildlife, having grown up in a semi-rural section of Boise, Idaho. She’s lived in bustling cities across the country, as well Oxford, England. She says she’s never seen so many urban rabbits as she has in Chicago’s Ravenswood neighborhood. In Fall of 2003, the theater professional (she manages production at Court Theater) landed in Chicago. She says she immediately took in two “Candy Land-like surprises”: a superb chocolatey smell wafting in the air and ... rabbits. Everywhere. Jennifer&apos;s lived here for 10 years, long enough to have lived through 2013-2014’s “Snowmageddon” season. Like many Chicagoans, she worried about people who didn’t have adequate cold-weather shelter, but the fate of the rabbits sprang to mind, too. Knowing most of them actually do die off, she says the rabbits’ reproductive rate makes perfect sense. “I guess this is how nature keeps things in balance,” Jennifer says. But ... she’s still curious to know if they are just cuter versions of rats. Gabrielle Wright is an intern for Curious City. Follow her at @GabiAWright.